It is with great joy and praise that I am posting this article written by Mr. John Tng. One was given a prophetic word and to the other the interpretation. This is a very timely interpretation as Obama’s presidential time is already ending. It’s been a long time since I last wrote. I want to revisit an old puzzle I believe you will find interesting. The Holy Spirit gave Jim Bramlett 6 scriptures and a statement many years ago. Each scripture and the statement contain the word ‘go’. I firmly believe that what Jim received is a rapture puzzle. I think I have found the solution. As you will see later, it is abundantly clear that the solution points to Obama as the antichrist. The rapture date appears to be coded as well, but I am not so certain of it. If you were to add the chapter and verse numbers of the six scriptures by ignoring the colon separator, a big number is obtained: 452 + 5212 + 5512 + 3314 + 614 + 2815 = 17919. This big number essentially nails the antichrist. Before his first presidential election, he made his famous 30-minute infomercial that ended with this grand promise, “… we will change the world”. From his birth on Aug 4, 1961 to the airing of the infomercial on Oct 29, 2008, there are 17254 days inclusive; this second big number has an intimate link to Jim’s number, 17919. But first, I need to spend some time explaining the significance of 17254. When the LORD showed me the identity of Obama back in 2008/2009, I stumbled on a verse hidden by God for us end-time watchers. In the Bible there are altogether 31102 verses. God hides some very BIG secrets in the order number of these verses. One verse appears to be tailored for the antichrist. By regarding one verse as one day, day 17254 corresponds to verse 17254 which is Proverbs 30:2. This verse fits Obama to a ‘T’. Here are the evidences. First, remove the colon separator of Pr 30:2 so that the number formed is 302; this is BARACK in Hebrew (ברק : 2+200+100). Second, Pr 30:2 describes a BEAST, “Surely I am more BRUTISH than any man, and have not the understanding of a man.” Third, Proverbs 30 is chapter 658 of the Bible (there are 1189 chapters in the Bible). If you remove all chapters between chapter 658 and chapter 1180 (the 666 beast chapter of Re 13:18), the remaining number of chapters in the Bible is 666. Fourth, the Hebrew gematria of Proverbs 30:2 is 1318 — the chapter and verse number of Re 13:18 with colon separator removed! This last fact is very significant since it is the only verse in the Bible with this gematria value. God could not be any clearer. BARACK (evidence #1 above) and his deep association with the 666 (evidence #3) BEAST (evidence #2) of Re 13:18 (evidence #4) is captured in one verse, verse 17254 — pointed to by day 17254 — the day Obama declared to the world to change the world. You need to appreciate day 17254 to appreciate the chapter and verse total of Jim’s six scriptures, 17919. Out of all the verses in the Bible, verse 17254 clearly spells out the identity of the antichrist — his name (BARACK), and his link to Re 13:18 as the 666 BEAST. What about day 17919 in the life of Obama? Does it reveal Obama as the antichrist? Yes, it does. Be very shocked by this fact: day 17919 is day 666 counting from day 17254 inclusive! Jim received the prophetic scriptures and statement on Sep 18, 1975 — 39 years ago. At the time Obama was barely 14 years old. But God foresaw everything and gave Jim the Obama Code. What did Obama do on day 17919 (day 666) since his birth, which fell on Aug 25, 2010? 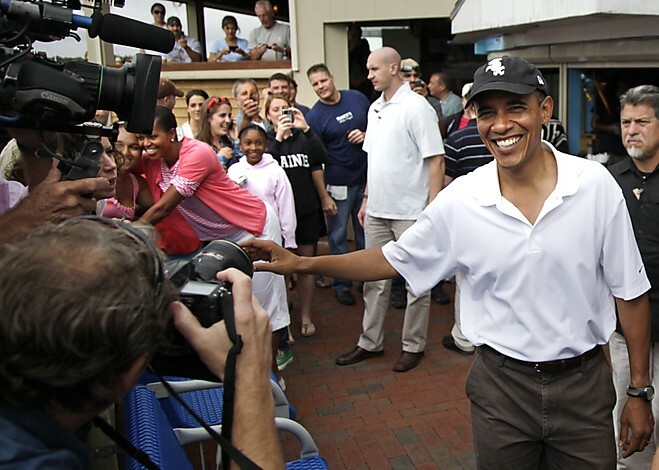 On this day, Obama and family had their summer vacation in Martha’s Vineyard, an island located south of Cape Cod in Massachusetts; it was day SIX of their vacation. Notice the cap Mr. 666 wore on day 666 — it is the symbol of 666! 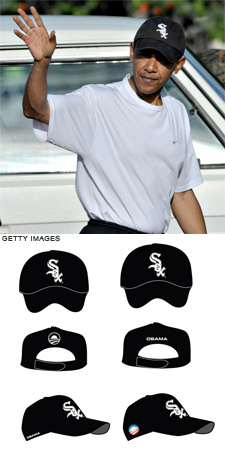 Obama is an ardent Chicago White Sox fan. 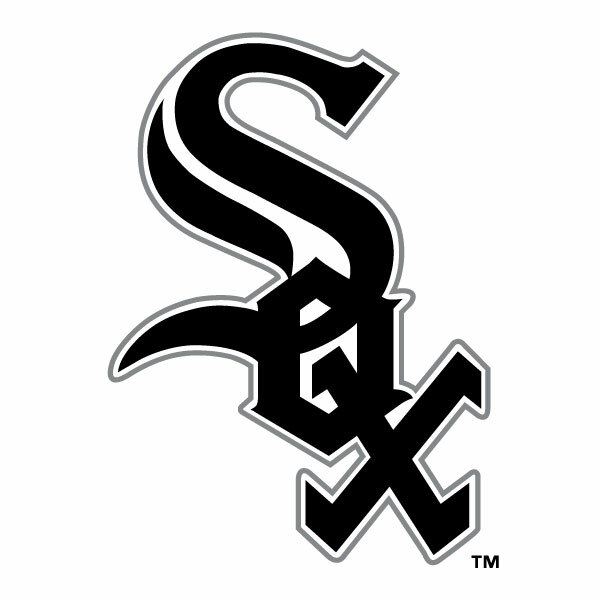 The logo of White Sox is simply the name SOX, in stylised design. One can see three instances of the letter S concealed — the middle white letter S sandwiched by two black letters S.
SOX SOX SOX is not exactly SIX SIX SIX. But wait a minute, the letter O is the SIXTH letter after the letter I — hence, SOX SOX SOX is SIX SIX SIX concealed! 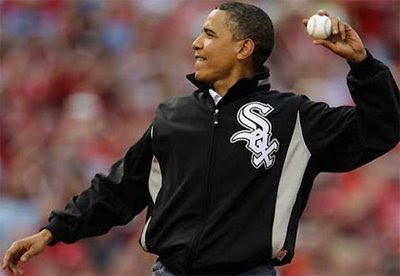 Of course, it’s just pure coincidence that Obama is known as the Big O. Could it be that the letter O in SOX is pointing to the Big O, the SIX SIX SIX man, hidden in the triple SOX logo? Maybe I am trying too hard to force a SIX SIX SIX on the man on his 666th day after he declared to the world that he was going to change it. But consider the location of Obama’s summer vacation — Martha’s Vineyard; there lies a dark secret that when exposed will remove all doubts that he is the dark prince. MARTHA’S VINEYARD, called “Noepe” by the Indians, means in their picturesque language “in the midst of the sea”; it is the largest island on the southeastern coast of Massachusetts (see link). The phrase “in the midst of the sea” is taken straight out of the Book of Revelation where Scripture describes the beast as rising up OUT OF THE SEA (Re 13:1)! “In the midst of the sea” is precisely “out of the sea”! There you have it — the smoking gun that proves that Obama is the antichrist. Let me say this upfront. I am very sure God is showing me who the antichrist is (I have another smoking gun, no less impressive, which I will share in another post). However, as for the Rapture Code, I am not so sure even though there are intriguing clues hidden in the rapture puzzle given to Jim by the Holy Spirit. I will lay it out for you and you decide whether I have deciphered the Rapture Code. Look at the puzzle again. Are you puzzled by the third statement separating the first two and last four scriptures? Why is it there? Why is it placed in the third position? Why is the sentence phrased the way it is phrased? You must admit there are other possible statements to express the same intended meaning; for example, the statement could have been phrased another way by dropping the word NOT and flipping WITH to WITHOUT — “He will GO out WITHOUT nervous compulsion or fear”. These are legitimate questions that no solution can afford to ignore. If you look at the broad structure of the puzzle, TWO scriptures — ONE statement, and FOUR scriptures — one cannot help but see in it the current Gregorian year, TWO zero ONE FOUR (2014). But is the solution that simple? If you consider the numbers associated with the first two scriptures, the upcoming Hebrew year starting on Tishri 1 (25 Sep 2014), appears to be coded there — 5775 (452 + 5212 + 45 + 2 + 52 + 12). So, coupled with the Gregorian year, we have a double witness here. Perhaps we are on the right track. Using standard English gematria system (A=1, B=2, …… I=9, J=10, K=20, …… R=90, S=100, T=200, …… Z=800), the ‘non-scriptural’ third statement has a value of 4932; when this number, together with the chapter and verse totals of the last four scriptures, 177 (55+12+33+14+6+14+28+15), are subtracted from the Hebrew year 5775, the difference is 666! This is not the only instance of 666. If we add the number 214 to the first scripture number, 452, we get another confirmation on 666! Taken together, the solution seems to suggest that the rapture will take place in the Gregorian year 2014 and Hebrew year 5775, in the time window between 25 Sep 2014 and 31 Dec 2014. Also, the ‘He’ in the third statement, i.e. the bride represented by Jim, will escape the Tribulation at the time when the 666 beast arises to ensnare the world. If indeed, Jim’s rapture puzzle is given by God, He must have left His signature hidden somewhere in the puzzle to confirm that the rapture message is from Him. Yes, He did sign His Name in the last scripture, Ge 28:15, TWICE! Subtract 2014 from the reverse chapter and verse number of the last scripture, 5182 – 2014; and the difference is 3168, the Greek gematria of LORD JESUS CHRIST (κυριος ιησους χριστος 800+888+1480; Phil 2:11)! Is JESUS the Encoder of the Rapture Code? Is He hinting that the rapture will take place in 2014? Let’s try something different. Subtract the reverse chapter and verse number of the last scripture with the reverse of the current year: 5182 – 4102. The difference is 1080, the Greek gematria of THE HOLY SPIRIT (το αγιον πνευμα 370+134+576; 1 Jn 5:7)! Is THE HOLY SPIRIT the Second Encoder of the Rapture Code? Is He also hinting that the rapture will take place in 2014? What about the other two possible subtractions involving the chapter and verse number of Ge 28:15 without reversing? 2815 – 2014 = 801 = ??? -(2815 – 4102) = 1287 = ??? When the two differences, 801 & 1287, are combined with 1080, THE HOLY SPIRIT, the sum is 3168, LORD JESUS CHRIST, again! Thus, the LORD JESUS CHRIST signs His signature twice in the last scripture, Ge 28:15. Notice the Lord’s signature will not appear at all with any year other than 2014!